The Kamuina Nsapu insurgency arose last year as a locally rooted conflict in the Kasai-Central province of the Democratic Republic of Congo (DRC), but has since gained intensity and is spreading to neighbouring provinces. By January, 216,000 people had been displaced, and more than 400 killed, according to humanitarian sources. In one town, Tshimbulu, at least 84 militia members were killed between 9 and 13 February 2017. Mass graves have been discovered in the area since. Two recent events have drawn national and international attention to the crisis. In February, videos circulated on social media that appeared to show a brutal army crackdown in Kasai-Central. The UN Office of the High Commissioner for Human Rights called on the government to halt human rights violations, including apparent summary executions, by the armed forces. On 12 March, six people were kidnapped in Kasai-Central, including one American and one Swedish member of the UN Group of Experts investigating violations of international sanctions and international humanitarian law, and four Congolese working with them. The circumstances surrounding the alleged kidnapping, the first such incident in the expert panel’s long existence, should be clarified as soon as possible, not least in light of the need for international journalists and researchers to access the country’s increasingly troubled interior. At the national level, a dangerous political stalemate continues following President Joseph Kabila’s decision to stay in power beyond his constitutionally mandated term limit in December 2016. Despite the agreement mediated by the Catholic Church and signed by the government and opposition party leaders on 31 December, which called for a transitional government and elections by the end of 2017, significant issues remain unresolved. With the economic crisis deepening, instability is rising, not only in the Kasai region but also in North Kivu, Tanganyika and Kongo-Central. While much of this violence is rooted in local causes, it directly challenges state authority, and serves as a warning that the political crisis at the national level is further destabilising the country’s provinces. Violence in North Kivu province, recently visited by Crisis Group, has already affected preparation for elections, and this could be repeated as voter registration rolls out across the country. It is vital that conflict resolution mechanisms are established or boosted at the local level in anticipation of further problems. MONUSCO, the UN’s largest peacekeeping mission, has only minimal capacity to respond to civil unrest or widening conflict. Nevertheless, UN troop and police presence in potential hotspots could deter security forces from committing abuses, and the mission’s monitoring and good offices will remain important. In a welcome move, the UN Secretary-General on 10 March requested the Security Council to approve an additional UN police presence, including in the Kasai region, noting a “high risk of urban violence in the upcoming electoral period”. 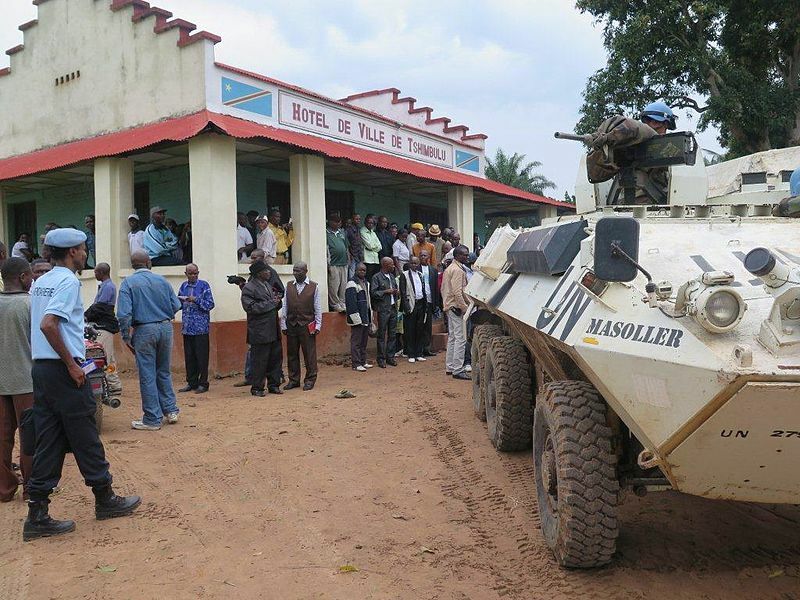 The Security Council is scheduled to decide on possible changes to MONUSCO’s mandate on 29 March. The Kasai region, which was split from two into five provinces in 2015 in a policy known as découpage, is one of the DRC’s poorest, and usually far off the radar of politicians and diplomats in the distant capital, Kinshasa. Since April 2016, it has experienced an increasingly violent insurgency by the Kamuina Nsapu militia, named after the title of a hereditary chief in Kasai-Central province. Fighting has rapidly spread from Kasai-Central to neighbouring Kasai, Kasai-Oriental and Lomami provinces. This insurgency has its origins in local tensions in Kasai-Central province. However, it has quickly tapped into the long-running political and socio-economic frustration in the Kasai provinces, and is also tied to national politics. The national and provincial governments’ legitimacy in the region is particularly weak. The crisis is now impossible to ignore and will require sustained effort on the political and development fronts to contain and eventually reverse. Kasai-Central, the origin of the insurgency, ranks very poorly in its human development indicators, including high levels of child mortality and malnourishment, as well widespread illiteracy among women and girls. A 2012 World Bank report puts provincial per capita income below $200 per month, among the lowest in DRC, and an earlier study by the bank questioned the financial sustainability of the separated Kasai provinces. The province has diamonds and gold, but there is no industrial mining. Infrastructure and electricity supplies are inadequate. The province’s only major industry, the Brasimba brewery, was recently closed, leaving the public sector as the largest employer. Kananga is the birthplace of Etienne Tshisekedi, the historic leader of the Union for Democracy and Social Progress (UDPS) opposition party, and, until his death on 1 February 2017, the head of the Rassemblement opposition coalition. In the 2011 national elections, Tshisekedi and the UDPS dominated in the region. In Kasai Occidental (now split into Kasai and Kasai-Central), he obtained 75 per cent of the vote, and in former Kasai Oriental (now split into Kasai-Oriental, Sankuru and Lomami), he won 70 per cent. When President Kabila was declared the winner of the deeply flawed polls, the feeling that the national vote had been stolen by the regime was particularly strong in the area, where Kabila remains very unpopular. Current Prime Minister Samy Badibanga, originally from Kasai-Central, led the dissident UDPS parliamentarians who in 2011 took up their seats in defiance of the party line boycotting the parliament. They were consequently expelled from the party. The UDPS boycotted the 2006 elections (none have been held since at provincial level) and is therefore absent from the provincial parliaments and governments, all dominated by the ruling majority. Despite the Kasai provinces being home to numerous other senior political figures, including Evariste Boshab, former interior minister and deputy prime minister, many locals are unhappy that no Kasaian has ever led the country. Many are also frustrated that their representatives have not invested in Kasai’s economy, particularly in comparison to what they see as the better served Kivu and Maniema provinces. It took a fairly commonplace local problem, the politicisation of the installation of a hereditary chief, Kamuina Nsapu, to ignite a cocktail of frustrations. With feelings against the government already running high, the chief managed to mobilise followers and to gain support for his anti-government cause. Kamuina Nsapu is the hereditary title for the chief of Bajila Kasanga, or Bashila, a groupement containing several villages in Dibataie sector, Kasai-Central province, approximately 70km south east of Kananga. Since colonial times, the Bajila Kasanga chieftancy has spread and established several other groupements in the region, extending into Angola. In the DRC, traditional chiefs are integral to public administration, receiving a salary and managing villages. They have a role in the control of land and may perform an important spiritual function. Chiefs are appointed according to local traditions, and then recognised by the state. In principle, the chief is apolitical, but, to be recognised and maintain his position and authority, he is often pressured to align with the regime. Politicians and officials have also increasingly challenged traditional authorities by creating, and even selling, new chiefdoms. Tensions between state and traditional authority triggered the current conflict. In 2016, the state refused to recognise the traditional appointment of Jean-Pierre Mpandi as Kamuina Nsapu, and the provincial governor reportedly refused to meet him. This was considered an insult, and put the chief and the state authorities on a collision course, further aggravated by the state recognition of lower-ranked Bashila leaders. Subsequently, Mpandi criticised the regime in a nationalist diatribe using xenophobic language, decrying the presence of foreign mercenaries and what he called a government of occupation. Like many radical critics of the regime, he focused on its supposed Rwandan origin. It took a fairly commonplace local problem, the politicisation of the installation of a hereditary chief, Kamuina Nsapu, to ignite a cocktail of frustrations. According to local observers, the decision not to recognise Mpandi as chief was prompted by the then Interior Minister Evariste Boshab, because Mpandi was considered close to the opposition and refused to support the presidential majority. In January 2017, the new Interior Minister Emmanuel Ramazani Shadari stated that Mpandi had taken radical anti-government political positions as far back as 2013. Crisis Group was told during a recent visit to Kasai that the relationship between Mpandi and provincial authorities deteriorated following the 2015 découpage, which led to an increase in harassment of the population by the provincial and territorial authorities. In April 2016, while Mpandi was in South Africa, provincial authorities dispatched security services to the chiefdom to check for weapons. Mpandi later accused the authorities of entering sacred places, stealing traditional regalia and attempting to molest one of his wives. He accused the security forces of harassing the population and evicted them from the area. The chief increasingly considered the state and all its representatives, including the Independent National Electoral Commission (CENI), to be his enemies and incited his followers to rise up against them. After months of escalation, Mpandi, some of his followers and several members of the security forces were killed on 12 August 2016. Several of his supporters do not believe Mpandi died. Since early December, Kamuina Nsapu militia attacks on state institutions have intensified, including in Kananga and Tshikapa, the capital of Kasai province, and violence has expanded to Kasai, Kasai Oriental and Lomami provinces. In several Crisis Group interviews in Kananga, local observers said many young men and boys, some as young as five, had been conscripted or joined the militia. Its members wear red headbands or armbands, and like the Mai Mai groups operating in eastern DRC they undergo rituals and carry amulets that are believed to bring invulnerability. Some have guns, likely looted from the security forces. The government and several local observers claim some politicians support the insurgency. With no identifiable leaders, their demands are hard to verify. However, four elements were repeated during Crisis Group’s interviews in Kananga in January: calls for the return of Kamuina Nsapu’s body for burial, to which the government agreed after talks with the family mid-March; reparations to Kamuina Nsapu’s family; repair of damaged hospitals and schools, to which the government has committed itself; social and economic development of the region; and the release of arrested militants and civilians, a demand the government partially met in February when it freed several prisoners and in March committed to continue the process. However, when self-proclaimed spokespersons for the group appeared in local media in late February, the demands became national, including a call for the quick implementation of the 31 December agreement. This appears to reflect wider popular frustrations as the Kabila regime hangs onto power. The Kamuina Nsapu insurgency has become a symbol of widespread dissatisfaction of both the Kasai urban and rural populations. The defence of traditional customs and practices found particular resonance among the public and other traditional chiefs. Optimism that a new UDPS-led government could calm the situation took a blow with the death of opposition leader Tshisekedi last month. Recently, in a further alarming twist, insurgents have also targeted Catholic institutions, for unclear reasons. The government has created a new military zone covering Kasai, Kasai-Central and Kasai-Oriental provinces. Numerous army reinforcements have been deployed and Kananga is increasingly militarised. Poorly paid, badly led and trained, members of the Congolese security services are often accused of using disproportionate force, which the government denies. In December 2016, MONUSCO sent military reinforcements to the area, followed by human rights observers, and in March published a strongly worded statement denouncing the restrictions imposed by the security forces on its freedom of movement. Following recent evidence of abuses by the Congolese armed forces and reports on the discovery of mass graves, the UN High Commissioner for Human Rights called for an investigation. In late February, responding to the mounting international pressure, the government dispatched a mission to investigate events and in mid-March announced the arrest of seven members of the armed forces, including several officers. The political response was late and ineffective. Former Interior Minister Boshab visited in 2016, but took little action to follow up. The opposition, busy with the political dialogue in Kinshasa, has been mostly absent from the local scene. A parliamentary question about the situation was tabled in December 2016. The provincial assembly has not yet visited the affected areas, citing a lack of resources. In late January, militia incursions in Kananga prompted Prime Minister Badibanga to abandon two attempts to visit the area. This painfully demonstrated his and his government’s lack of popular legitimacy in his home region. The government renewed its political efforts with the visit on 12 March of Interior Minister Emmanuel Ramazani Shadari, whose delegation included opposition members of parliament. He held talks with the Kamuina Nsapu’s family. On 16 March, the parliamentarians published welcome recommendations, including the appointment of a new provincial administration and measures to manage conflicts with the customary authorities. On 17 March, the government announced a less far-reaching compromise, including burial of the Kamuina Nsapu, measures on detainees and an agreement on the procedure to select a new chief. However, this agreement is unlikely to solve the underlying issues, and even Shadari admitted that pockets of instability would persist. The conflict has considerable humanitarian and political consequences. If the displaced and other affected communities are not able to prepare the next planting season, food insecurity will increase. At the political level, the CENI is preparing to start voter registration in the Kasai provinces, but in conflict-affected areas, offices have been destroyed and staff threatened. Displaced people must vote where they registered, which can be problematic. Anti-state sentiments resonate strongly among local citizens, which may lead many to not register at all and would leave pro-opposition areas with low vote counts. A first important step will be the creation of adequate security and trust for the people, including the displaced, to participate in the process. The 31 December political agreement called for simultaneous national and provincial elections by the end of 2017. Local elections are to follow at a later stage. Given the high stakes of the election and the troubling local conflict dynamics, legitimate mechanisms to resolve disputes should be put in place before polls are organised at the provincial and local levels. Local research, used by the UN, has identified no less than 79 potential conflicts in Kasai-Central province alone. More than half of these are related to tensions with traditional authorities. Because provincial elections also add to the cost and to potential delays, consideration should be given to uncoupling them from the national polls. Intensified initiatives for voter and civic education that can counter violent, messianic and xenophobic messages, targeting specific communities, are also necessary. The national and provincial governments should strictly adhere to existing legislation on chiefdoms, and refrain from any divisive interference. In the meantime, the government should demilitarise domestic policing and establish provincial mediation and conflict resolution mechanisms, constituted by local and provincial groups, with support, if needed, from the national government and international actors. Stalled negotiations over implementation of the 31 December agreement, in particular the delay in installing an opposition-led government, are raising tensions and triggering popular unrest and insurgencies in pockets across the country. In January 2017, conflict between the Bundu dia Kongo (BDK) movement and security forces occurred in Kongo-Central and Kinshasa. Like the Kamuina Nsapu militia, the BDK combines mysticism with a populist political message, and is rooted in the fragile legitimacy of national political institutions and in economic problems. While none of these local conflicts alone are likely to fundamentally disrupt the national picture, they risk undermining the all-important voter registration process and thus the integrity and timing of the future elections. While local measures are important, maintaining the path toward elections to ensure representative government structures is ultimately the only way out of this quagmire.